to Make Way for Construction to Start! ﻿uovo is for those who appreciate the finer things. Like a memorable evening in a perfect little place no one else has discovered yet. Or the appealing dissonance of jazz. Like a beautiful painting, abstract and full of angles and colours. 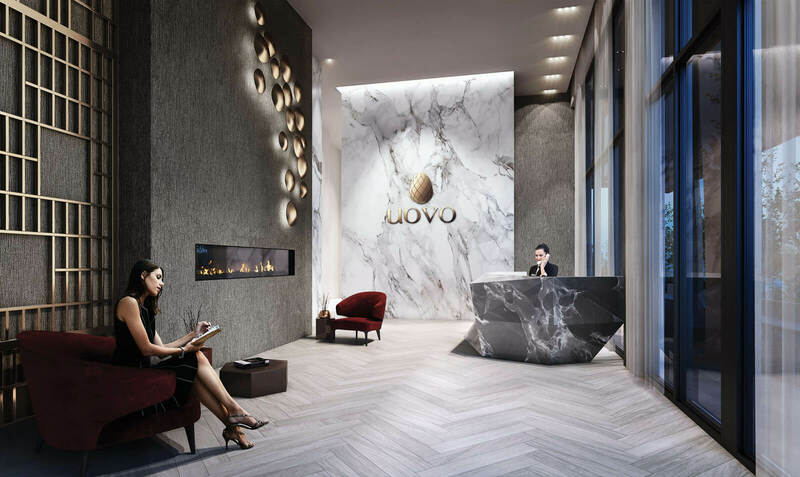 Beautifully orchestrated and thoughtfully designed, ﻿uovo is a uniquely intimate boutique residence at Yonge and Hillsdale. 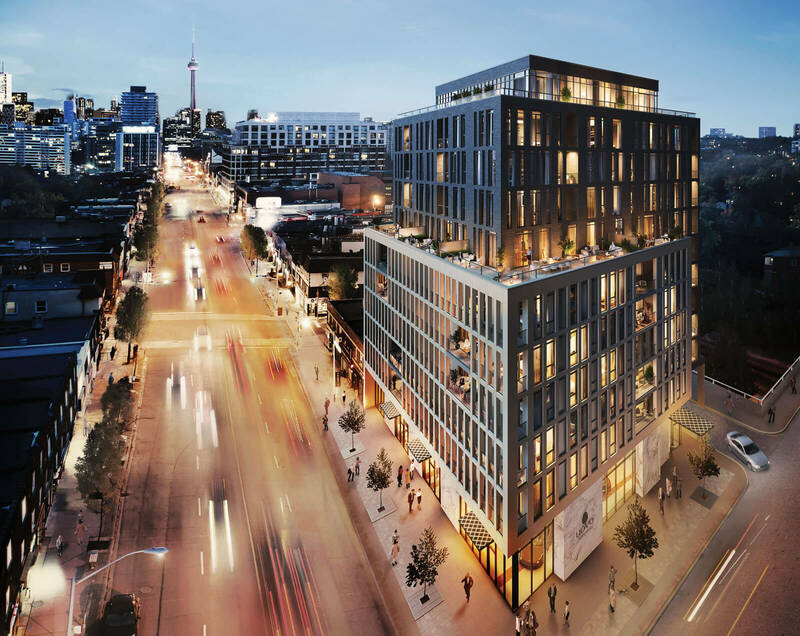 It’s steps from Davisville, and just south of Yonge and Eglinton, where the city really comes alive. 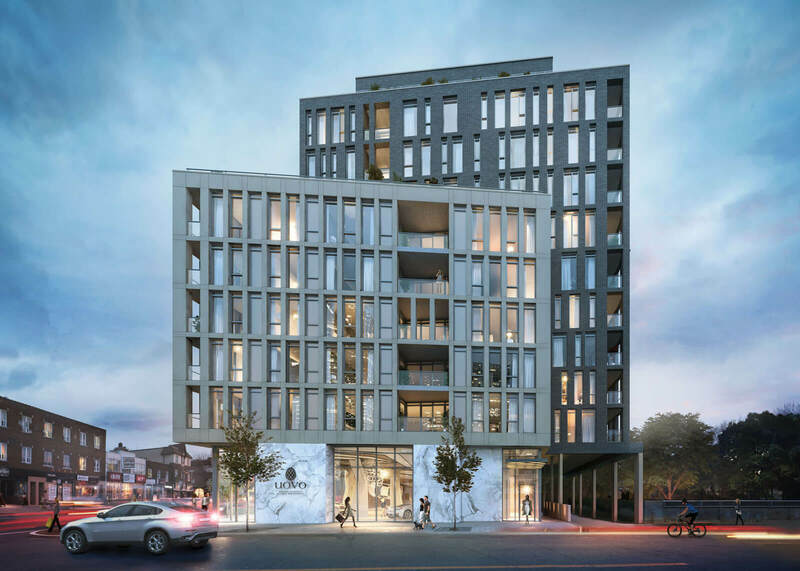 Architecture brought to you by the talent of Raw Design, with interiors by renowned EsQape Design, this elegant residence has 62 single-storey condo suites, each with its own private outdoor space – plus five soaring two-level penthouses with expansive terraces overlooking the city below. Suite designs executed by The Walsh Group. The building’s sleek, understated décor soothes the soul, with unexpected touches of elegance like the asymmetrical concierge desk that evokes a modernist sculpture, and the building’s unique laser-cut lattice exterior. 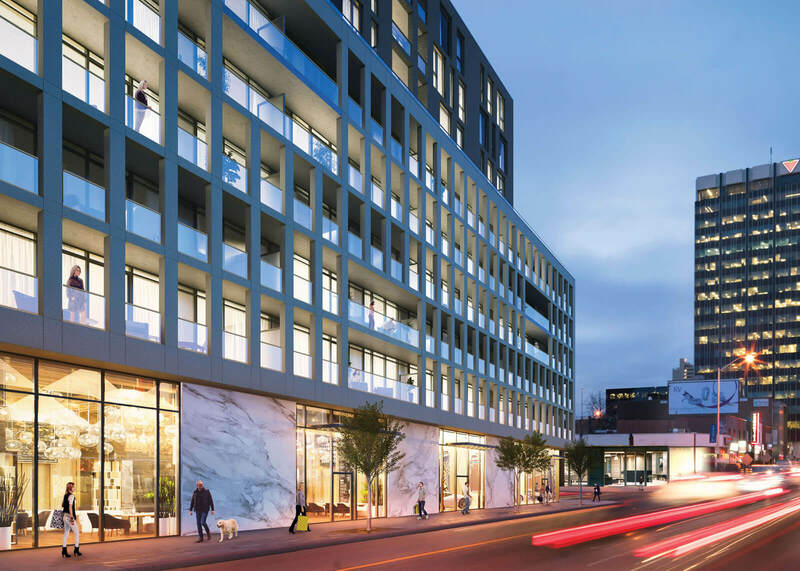 ﻿﻿Designed for comfort and an elegant lifestyle, uovo suites are generously designed, with 9- and 10-foot ceilings, floor-to-ceiling windows and great views of the city. The lower levels feature nine suites per level, and upper levels (7-10) have just six. 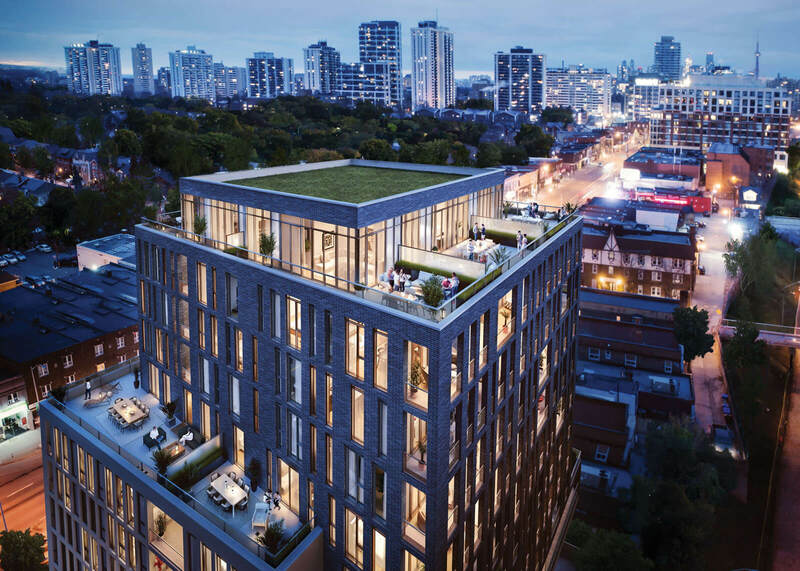 While all suites have outdoor spaces, the seventh floor terraces truly shine – the building’s setback offers large outdoor spaces up to 948 square feet, with plenty of room for patio furniture and entertaining friends and family. 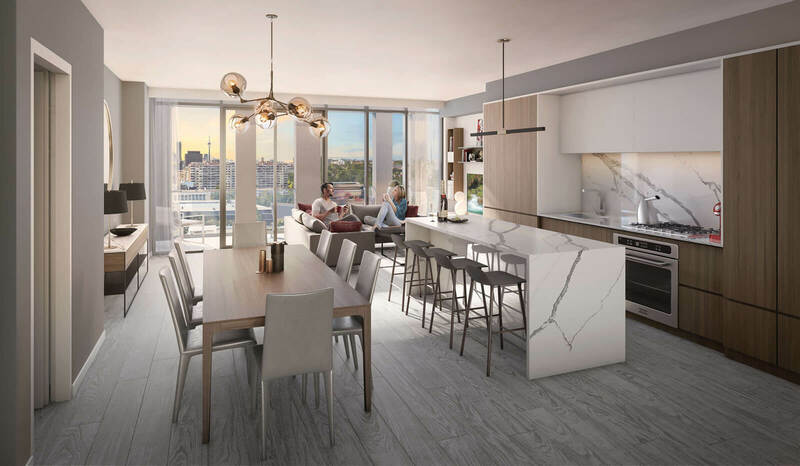 An indoor-outdoor gas connection comes standard with each suite, so you can whip up dinner on the premium gas cooktop in your designer kitchen, or grill steaks to perfection out on the balcony or terrace while enjoying an al fresco glass of wine. Central to the cooking experience is an oversized 3ft wide island in two varying lengths (6ft or 8ft) based on your suite layout. The overhang­­ is perfect for breakfast, dining or gathering around with friends and family. The island is complete with a wine fridge and plenty of drawer space for your large cooking pots. 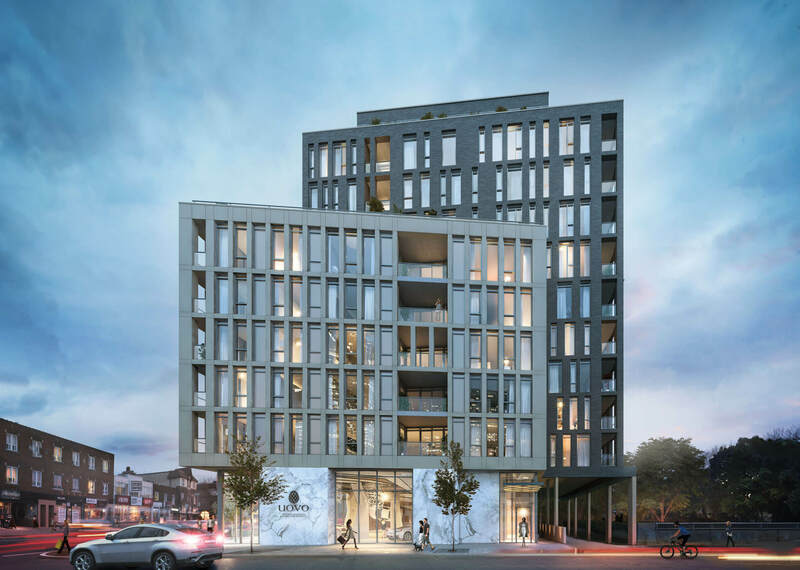 ﻿Beautiful porcelain panels and plenty of glass add grace and polish to the streetscape, with smooth lines and sharp angles giving the structure a pleasing asymmetry that both compliments the neighbourhood and stands quietly apart. ﻿Five breathtaking two-level condominium suites top of the building, offering unparalleled living for discerning residents. 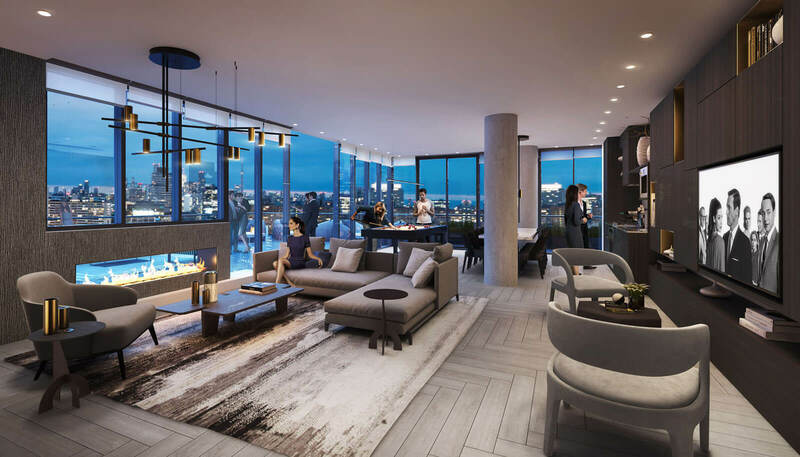 Large terraces complete the glass-enclosed upper storeys of these elegant suites, offering gracious, private spaces for entertaining, relaxing and enjoying the sun. ﻿Catching some rays, grilling a ribeye or watching the game – you can do it all in uovo’s shared spaces. 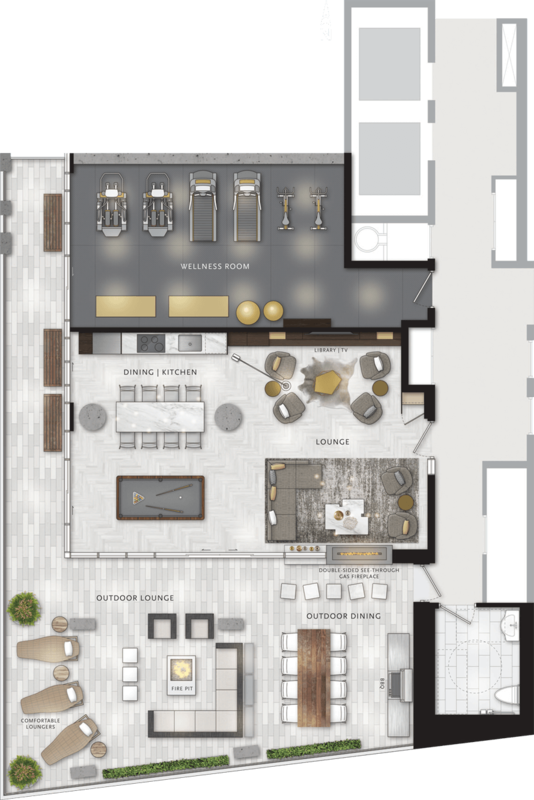 You’ll find the bulk of the building’s amenities on the second floor, with a fitness area and a beautiful indoor-outdoor space that’s perfect for a party or some solo quiet time. ﻿Need to get your heart rate up? Head to the wellness room, a serene spot with cardio machines and other exercise equipment, with areas for stretching and yoga practice. Get together with friends in the lounge – it has a full kitchen and dining area, billiards table, library and TV area, and cozy fireside seating beside a double-sided, see-through fireplace that connects to the terrace outside. Head outdoors, and you’ll see the elegant terrace has plenty of space for dining, barbecuing and entertaining. Gather around the firepit or beside the beautiful fireplace, enjoy dinner al fresco at the big dining table, or make a beeline to the comfortable lounge chairs to soak up some sun. The amenities are designed to make living easy. There’s a handy pet spa off the lobby where you can clean up your pup after a walk – no need to get your own bathroom dirty. And if you get around on two wheels, there are bike racks for all residents and generous visitor bicycle parking. 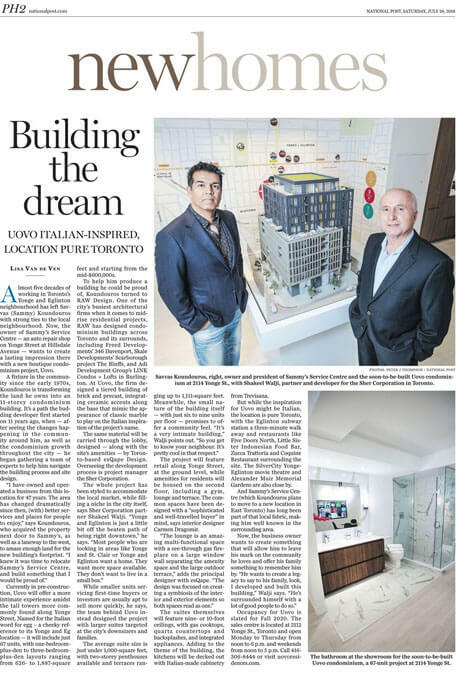 Uovo is truly spectacular new condo development in the heart of Toronto.